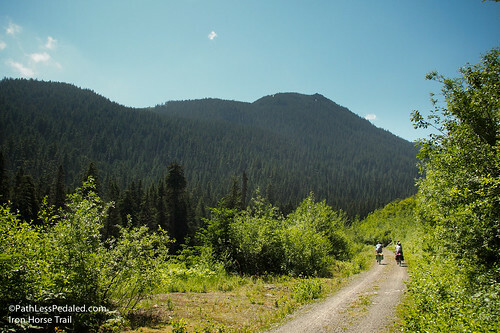 When we heard that our friend Jason from Swift Industries was planning a little weekend bike touring / fly fishing extravaganza for the 4th of July AND that we would be riding a portion of the Iron Horse Trail, we couldn’t say no. 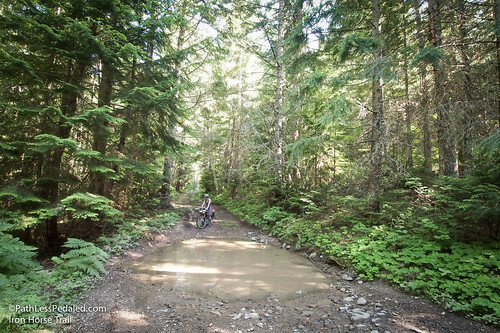 We have been eyeing the Iron Horse Trail for quite some time because it looked like an intriguing gravel ride and because it seemed to have good bike tourism bones. Surprisingly, for a trail of its length, proximity to Seattle and general potential for awesomeness, there is very little information about it. 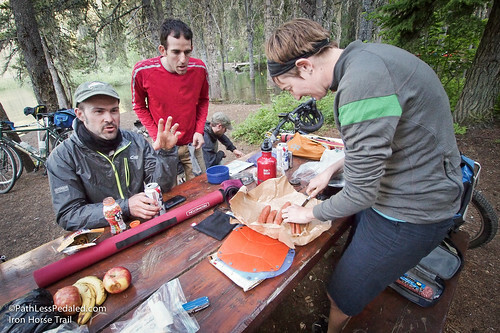 There are some odd trip reports here and there, but nothing with photos that really give you a flavor of the trail. 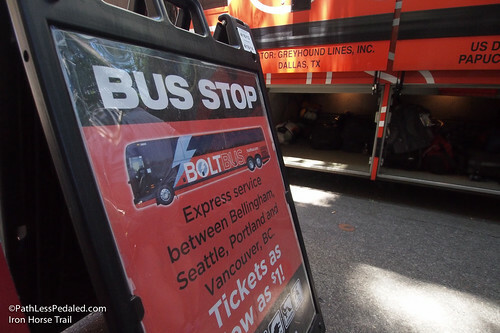 We boarded the BOLT bus in Portland. For those that don’t know, the Bolt is a generally less sketchy Greyhound (though it operates The Hound umbrella). The coaches are newer, have WiFi and MOST importantly aren’t jerks about taking bikes. 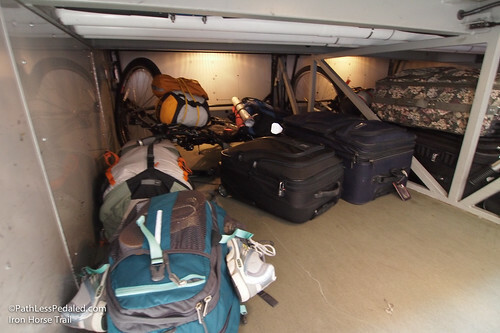 Interestingly, the buses don’t have racks but instead allow you to place them in the luggage area UNBOXED. For us, this illustrates that accommodating bikes is more about attitude/policy than hardware. We’ve taken the Bolt bus where they have accommodated upto 6 bikes sans bike rack. Also interesting to note was that the bus was full of Gen X/Y riders. Our generation may not be into owning cars, but it doesn’t mean we don’t like to travel. 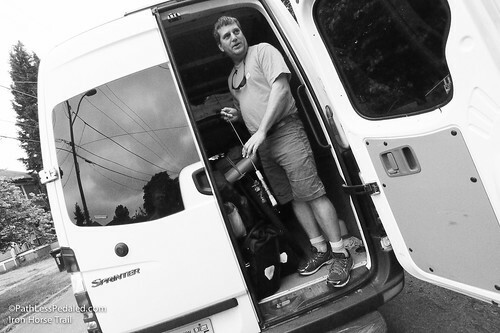 It just means we will travel to places that are easy to get around without driving. After taking the bus to Seattle, we all gathered the next morning and got a lift from Steve, who actually wrote his graduate thesis on the Iron Horse Trail and is active in mapping and advocating for the trail. It was great to hear his insight about the potential and challenges of the trail. 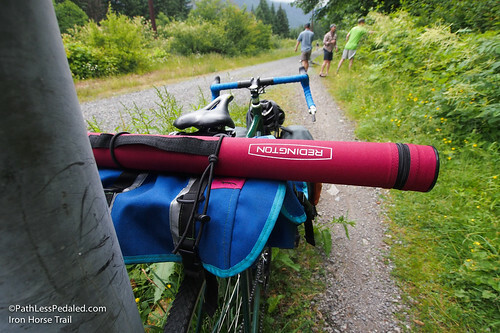 We started riding at the trailhead at Rattlesnake Lake (about 43 miles from Seattle). The trail is unpaved gravel which is very rideable but is more enjoyable with some fat rubber. I was riding my new Surly Ogre with 2.3 inch tires and Laura was riding her monstercrossed Vaya with 45mm Vee Rubber tires. There was no tire skinnier than 35mm on the ride. From Rattlesnake Lake we rode East on the trail, which is generally trending uphill. It climbs at a railroad grade, so it was pretty mellow, even with a load. There were short stretches of loose gravel and some pot holes to negotiate, but for the most part the riding was easy and freed us up to talk with each other and enjoy the scenery. 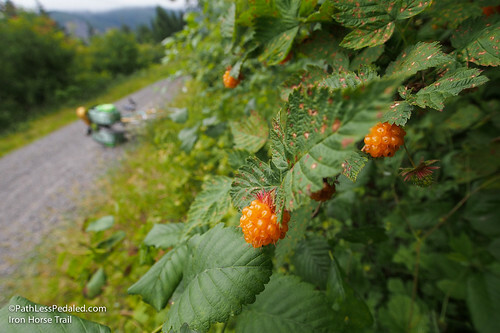 As you ride you’ll be flanked by salmonberry bushes, which we of course took a few minutes to sample. You’ll also ride over trestles and pass some cliff faces that are popular with climbers. The other big highlight is the Snoqualamie Pass Tunnel, a 2.5-mile tunnel that bores right through the mountain. 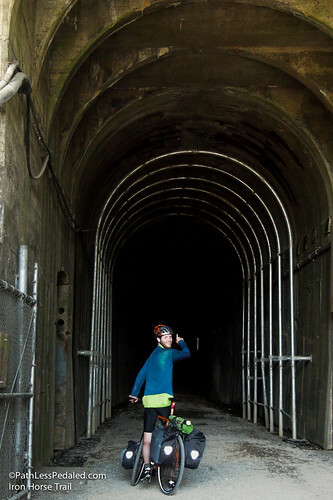 It is the longest tunnel open to non-motorized travel in the US. The sensation of traveling through a tunnel that long was a little unnerving but fun at the same time. The other end appears as a tiny pinprick of light in the distance that seems to grow larger at a glacial pace. Be sure to bring good lights and a windbreaker. On our return trip, the temperature outside the tunnel was a pleasant 75 degrees and inside was a breezy 45. Just after the tunnel is the Hyak stop, which has a small building with restroom facilities with flush toilets, sinks and running water. There were also showers there, though they seem to have been shut off. At Hyak we had a break for lunch. 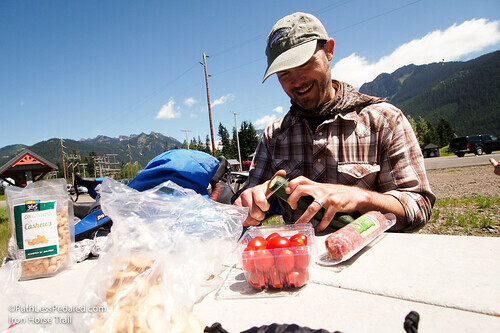 Soon after the trail crossed the Yakima river, we left the Iron Horse and headed for Lake Easton to find a convenience store to load up on more snacks. After the minimart, we made our way to our final destination, Lake Kachess. Through some navigational errors, we found ourselves on a pretty rough forest service road. Gone was the relatively relaxed Iron Horse Trail, replaced with fist-sized rocks and ponds that crossed the entire “road.” The going was slow but the climbing and obstacles made for a more exciting ride and was a good test of both my new Ogre and the Vee Rubber tires Laura was using on her Vaya. Both performed admirably. After an hour or two on the forest service road, we strangely emerged into a housing development, which was rather disconcerting after feeling like we were in the middle of nowhere a few minutes before. 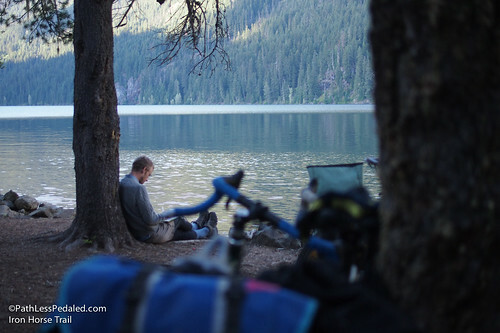 From that point, we were back on pavement and made our way to the official campground on Lake Kachess. Although it was mid-week, it was also the 4th of July so the campground was a little fuller than it would have been otherwise but it still wasn’t too bad. We found a rather large site and pitched our tents and made dinner at the day use area by the waterfront. 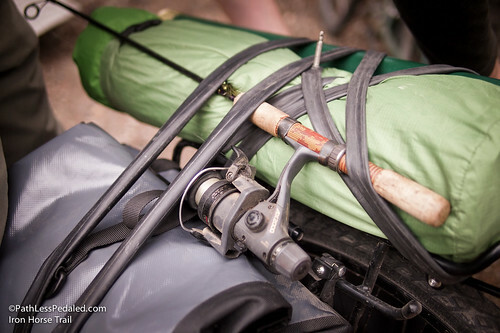 The next morning, we left base camp, carrying snacks and fishing gear. The plan was to pedal a few miles up a gravel road and fish Box Canyon Creek. We passed some promising spots early on, but they were already filled with cars and other campers. 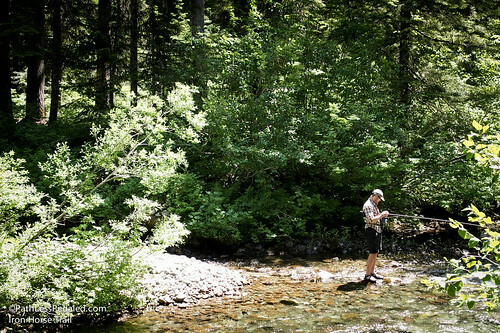 We pushed on and finally found one wilderness campsite by the river that provided both shade and beautiful scenery for the non-fishers and some promising little runs for the fishermen. 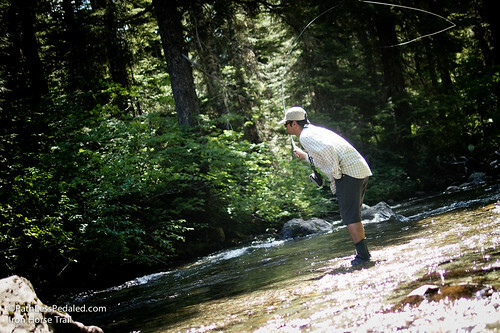 I eyed a promising little run and strung up my Tenkara rod and got into the water. Instead of waders, I use neoprene booties and my Keen sandals. They give me just enough insulation to stand in the cold water. After about 10 minutes I hooked up with a fish in some really skinny improbable looking water. It was a beautiful fat 8 inch trout that got off before I could handle it. It was an auspicious start, but the rest of the day was a little slow fishing-wise. I caught two other small ones, but that was it for the rest of the day. The next morning we got up early and took a more civilized paved path back to the Iron Horse Trail and essentially rode the route in reverse back to Rattlesnake Lake. From there, we parted ways with a few riders. The remaining group rode to Issaquah where we thought we could take our bikes back on the SoundTransit bus back to Seattle (cutting out 18 miles of urban riding), but we were turned away. The driver pointed to my front rack and said “No bikes with baskets are allowed.” Admittedly, my 29er was having a tough time fitting on the front rack. I completely deflated the tire to try to get the hook to slide over more securely but had no luck. All the while, the driver was no help whatsoever. I asked if we could take the bikes on board since the bus was pretty empty, but he said no. With that, we were left with no other option but to ride back, rounding off the day at just under 80 miles from Lake Kachess to Seattle. Fortunately we were all feeling pretty good and had it in our legs to do the mileage. But it seemed like such a disappointment that what could have been a convenient multi-modal connection was a non-option due to inadequate front racks and a none-too-helpful bus driver. Oh well. We rode only a portion of the Iron Horse Trail and really enjoyed it and look forward to exploring it more in the future. The section we rode was pretty tame riding (perfect for families or a S24O) but we hear it gets rougher the further east you go (downed bridges, crossing a military base, signing waivers to ride through tunnels, etc.,). But we’ll save that part for a future adventure. 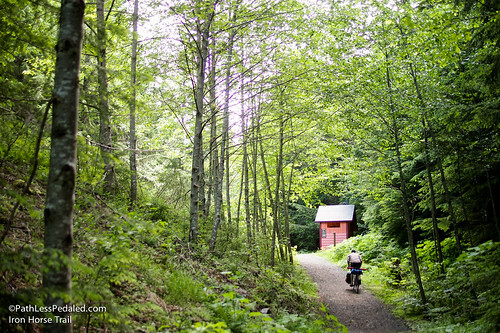 One thought that really stood out in our mind is how great a resource is the Iron Horse Trail. 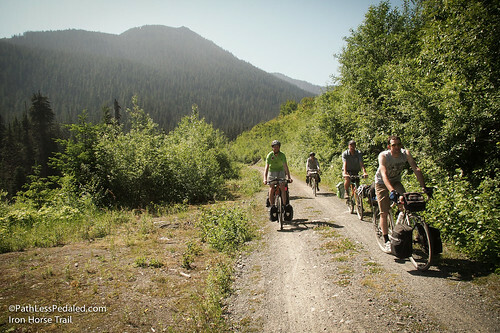 Our return trip was on a Saturday and we saw lots of day riders and climbers using the trail. Despite that, we felt that it could be even MORE popular. Being just a visitor and not privy to the politics of the trail, I was surprised at the lack of marketing behind the Iron Horse. It really could be an awesome bike destination, if only people knew about it and if the local communities seemed more connected to it. In the end, the riding was great, the fishing could have been better, but it was still a fine way to celebrate the 4th of July. The trestles! You didn’t mention the trestles. I live in Seattle and have ridden long portions of the Iron Horse twice now. 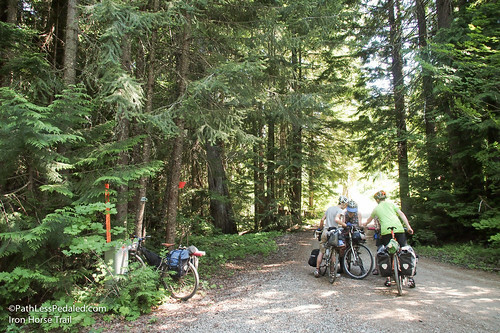 Once to the first campsite after the tunnel and the second time as part of a five day loop through the Cascades. 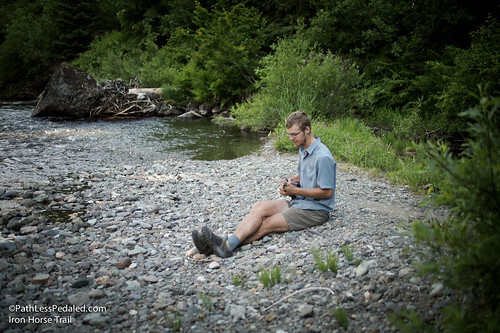 You’re right that it simply isn’t as well known as it should be, considering it is bar-none the easiest, most pleasant way across the Cascades and starts at the edge of the most populous part of the entire Pacific Northwest. After the big tunnel the trail is very ridable, though right now the smaller tunnels are all technically closed. Most tragic is that the section between Cle Elum and Ellensburg that runs along the Yakima in the canyon is closed. The 15 mile alternate is on paved roads and climbs up to a ridge before dropping back down. I think SR10 is a better choice, but when I tried to get through, THAT was closed for bridge construction too. Doug — planning on riding JWT next weekend from Suncadia down to Ellensburg & back. Do you mean the entire trail between Cle Elum & Eburg is closed? Or are you referring to the closure of the tunnels in between the 2 towns? Which as I understand from reports today have now been reopened? So what is the relation of this to the John Wayne Pioneer Trail? Paul they are one and the same but go by different names. Paul the Iron Horse State Park actually is only a portion of the John Wayne Trail. 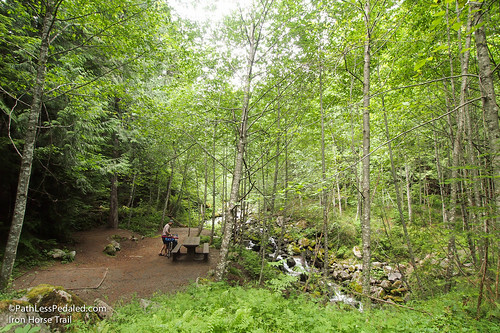 The State park goes from North Bend (Rattlesnake Lake area) to Vantage. The John Wayne trail goes farther across Eastern Washington and is not all part of the State Parks. Any chance of posting a GXP or other map to help others plan trips? Russ – I have had the same issues with incompatabilities putting bikes with racks onto the front bus racks. The best solution I have found so far is to put the bike on “backwards”, lean the bike away from the clamping rack arm to allow you to place the top of it right behind the seatpost / seat tube cluster and let it clamp down on the rack or rack stays. If you want to feel a bit more comfortable about this, toss a toe strap around the rear wheel to the rack to keep it tight. I have pictures of this somewhere on my camera. Once I post them online, I’ll send them to you. 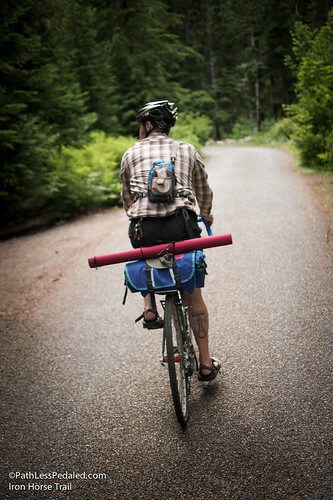 I’m planning a full-on ride across WA for 2014 with my son (Idaho border to La Push). Should take us about 10 days of riding plus a rest day. So far we have ridden the section from Rattlesnake Lake to Cle Elum (the old rail depot). 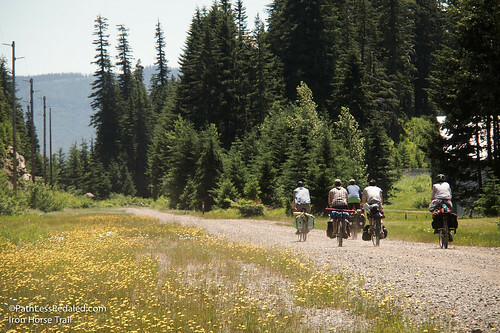 I would love to meet Steve someday and pick his brain about the trail east of Cle Elum. Forward him this message, if you wish. 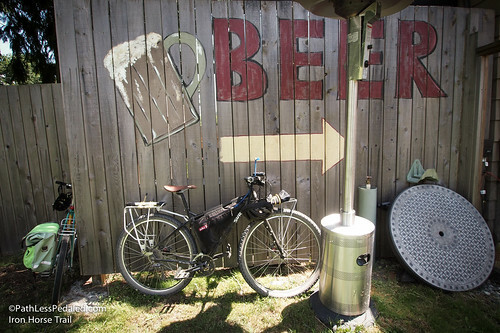 I just rode the Ironhorse this past weekend with a friend – Paul and Betty (Retrovelo Paul and Rivendell Betty Foy). 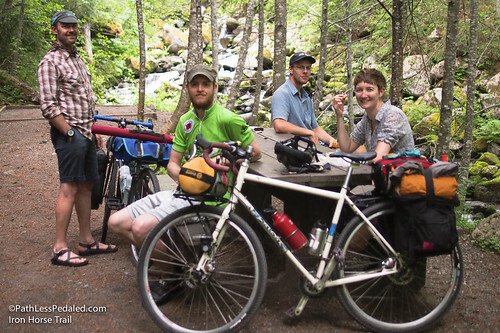 We rode from Seattle thru Woodinville and up the Snoqualmie Valley Trail to get to the trailhead at Rattlesnake. We made the entire trip to Vantage. It is an incredibly beautiful ride. Conditions on the other hand, deteriorate east of Easton. The trip into Ellensburg was rough gravel, east of Ellensburg was almost treacherous. We only had to walk our bikes a good park of the way between the edge of the Yakima Firing Range and the Bolyston tunnel as the trail was completely loosed up from heavy horse traffic. The trail remains very loose all the way to Vantage and at each hill cut the path was checkered with basalt boulders and rocks that have accumulated since the last trail grading. Hey Russ how did you like the Surly Ogre. I have a Vaya which I love, but I am thinking of getting into mountain bike off road touring. 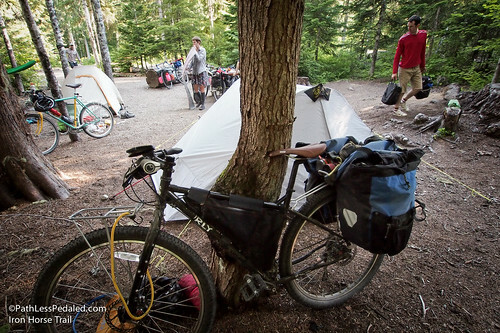 I am curious about bikes like the Surly Troll, Salsa Fargo, and the Ogre. I wonder if it is slow/hard riding a heavy large tire bike like that or if it is not really an issue? @Dave – Loving the Ogre so far. There is definitely a speed difference b/w it and the Vaya. 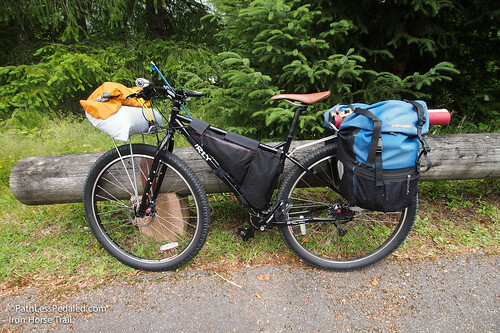 The bike is generally heavier and the tires aren’t the zippiest. Where it does shine is in rough terrain and single track. We’ve been running the tires at around 25psi and they’ve got great traction. Sounds interesting. Next chance I get I am going to try and test ride a large Ogre and a large Fargo and see how they ride. I have an old 26 inch mountain bike, but I always feel sort of slow on the 26 inch tires. The Meany Lodge is on the east side of the 2.5 mile Snoqualmie tunnel. About a 70 mile ride from Woodinville to Meany Lodge. 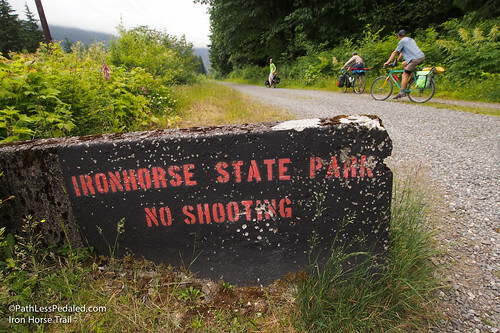 I’m very much looking forward to the Iron Horse Trail – particularly the 40 km Snoqualamie Pass Tunnel! At my speed, it will probably take me a couple of hours to pass through it. I love the idea of rail trails. I’ve not ridden on many (only one! ), as they are extremely rare in NSW. It’s nice to see abandoned railways put to good use. One of my other pastimes is trainspotting/railfanning. I’m looking forward to combining that and cycle touring. Ah. 2.5 mile long tunnel. I didn’t think it was that long! I missed the decimal point. Still, I wouldn’t have minded if it were 25!